An FBA involves slashing and spreading the tissue pattern to accommodate the excess width and length the extra curve of the beasts adds to the front of the pattern piece. At this point, it’s become second nature to me since it’s a needed adjustment on nearly every pattern. My lovely husband, Christopher, puts up with me and my humongous stash of craft supplies; plus, he will often join me at costume events wearing whatever wacky get-up I concoct for him. Since he puts up with my shenanigans so well, when he found some curtains at the thrift shop and requested I make an 18th century waistcoat out of them, I wanted to make darn sure that I made it look the best it could! I have made a few things for him before, including an 18th century suit, so I just re-used the same pattern since I knew how it worked and how it fit him. However, with much more practice and experience behind me, I now noticed some fit issues with the pattern. I knew from the previous years of working with the waistcoat pattern that the armholes were too small and neck too small, and now I noticed when we tried the waistcoat on from two years ago, it would hardly close in front even though it was gaping with extra fabric at the back…. 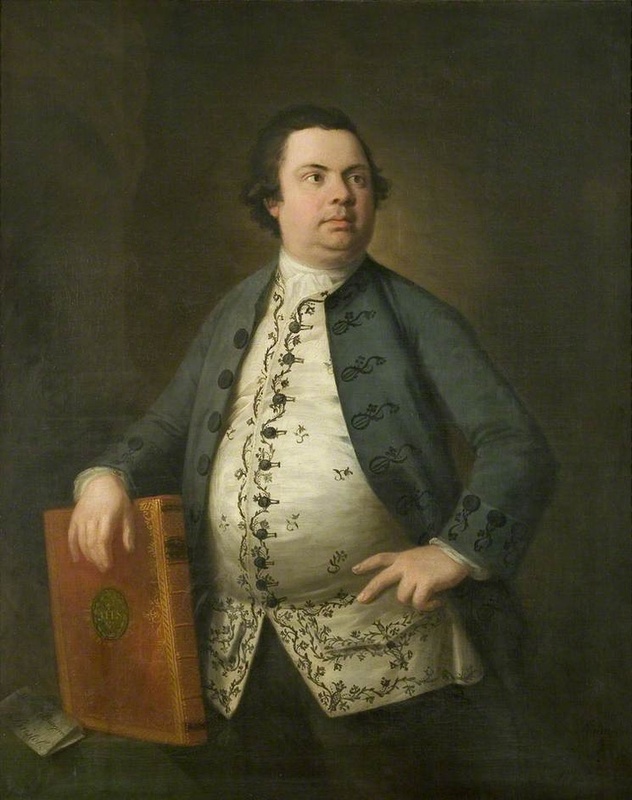 Many portraits from the first half of the 18th century show men with full bellies and waistcoats in various states of unbuttoned-ness. 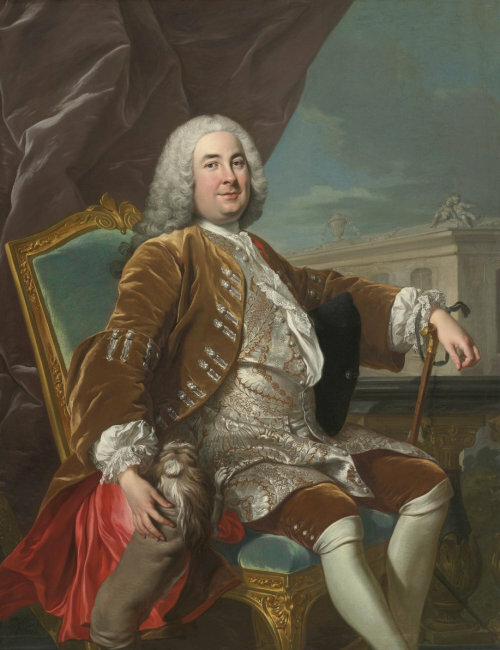 It was quite fashionable to pose in a portrait like this, displaying a luxurious, studied nonchalance that being wealthy afforded you the time to practice. 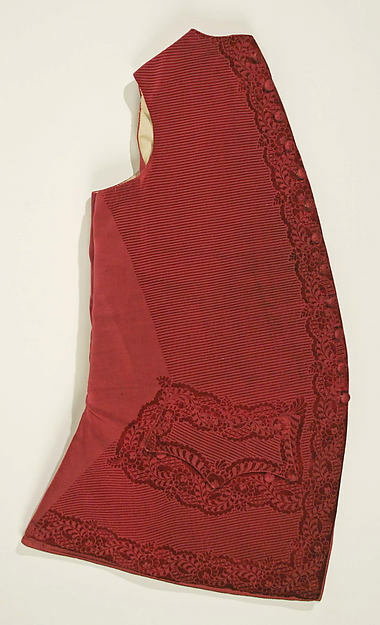 A very closely fitted waistcoat from later in the century. Tastes swung towards a more fitted, put-together look as the Industrial age rolled onto the scene. Mathematical precision, clean lines, and scholarly neatness were the new marks of the gentleman. While a perfect fit wasn’t required by the period, as evidenced by his old waistcoat’s triangular gap at the front that tended to pop open unexpectedly and the excess fabric at the back, something really should be done to make the costuming experience more enjoyable for us both. Christopher’s full belly would require an adjustment similar to my Full Bust Adjustment, only his would be a Full Belly Adjustment! In this photo, the pattern piece in the photo isn’t spread enough yet. Heck, it’s a miracle I even remembered to take a photo of it at all considering what a mad rush I was in! A very crude drawing of what I did. Sorry! Later-era waistcoats were shorter and often have a sharper curve to swoop back at the bottom, matching the cut of the coat. The FBA I performed does increase the width of the bottom of the waistcoat, so it fits loosely over his hips. For the era I was dressing him for, the 1710s and most of the 18th century, having a wide flare over the hips was a design feature rather than a problem. However, if you desire a close fit that pulls back in under the stomach, you will likely need to add some darts just like you would for a lady’s FBA, just lower. This waistcoat bears evidence of a FBA! 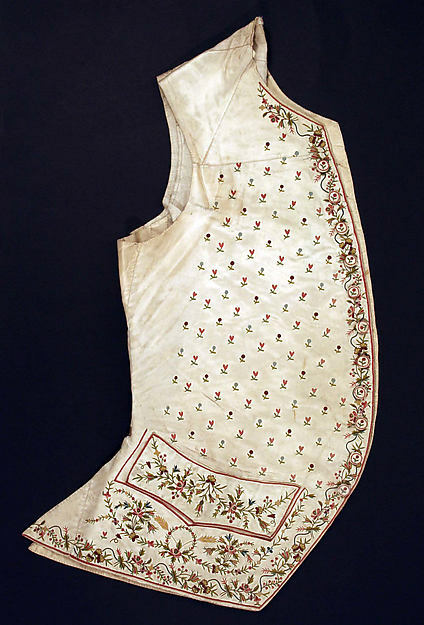 Waistcoats often were pre-embroidered or came with a pre-woven design that would be cut according to the new owner’s measurements. In this case, you can see the woven design ends before the side seam, which is wider and not as sharply angled. 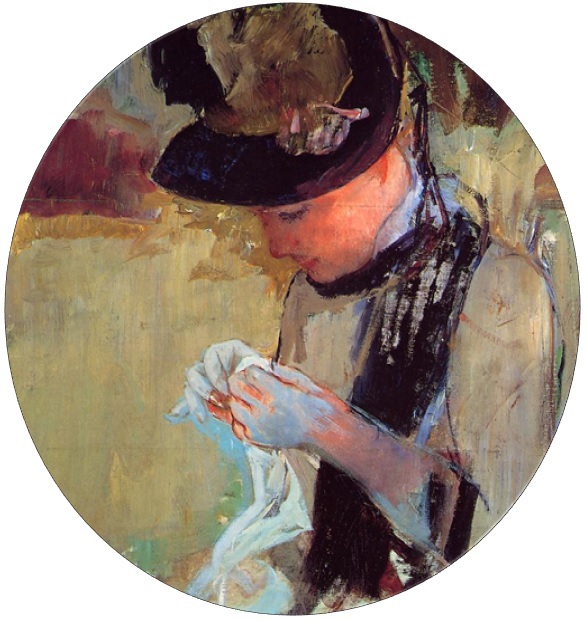 Since a gentlemen always wore a coat out in public, the bare edge of the waistcoat was covered. 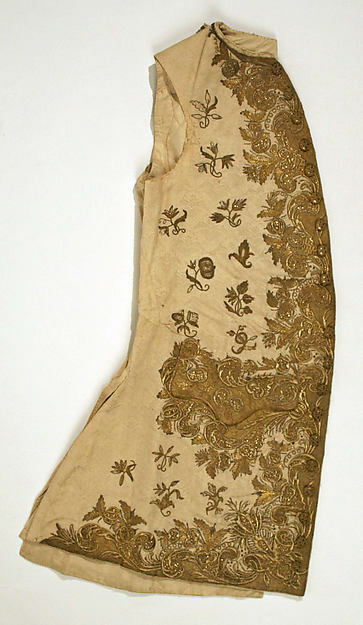 You can see another, later example of a pre-embroidered waistcoat that is larger than its decorative design here. Chris’s waistcoat ended up with a very similar shape. It is less dramatic than smaller waistcoats, but it functions much better! Here’s Chris’s final waistcoat fit. You’ll notice that it has no button holes. I had no time to add them since I started the waistcoat so close to the event (I was still sewing buttons on in the car), but, as you can see, I got the fit pretty spot on since the center front meets without needing to be held in place! Huzzah! Awesome Job on Chris’ costume. I am getting into the pirate stuff here in Florida and I have been working on makeing my own stuff. I am sure being a FB person myself that I wil lbe using you FBA pattern and technique. Thanks for sharing this. Thank you for this! My spouse’s measurements sound much like yours (meaning your husband, not you)! 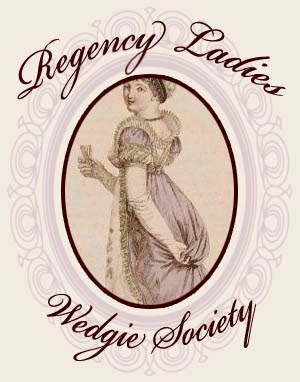 I am a week away from a local Dickens event, and am making my retired policeman husband a “Peeler” police tunic. Not only am I dealing with a commercial pattern that needs to be adjusted up one size at least – which I’ve never done before – but I also have to allow for the ample Santa Claus belly. He has been a professional Santa in the past, but I never had to make those costumes. Your post gives me great confidence that I’ll be able to make the FBA. I was hoping I could find something online that would help. Best of luck with your project! Send me a picture Facebook when you’re through! :) Also, since it’s 19th century, you can probably add a dart in under the belly if you need to control some of the fullness/flaring there.